Sid and Asteria Howard at work. "The Senior Center is very fortunate to have Coach Sid lead a fitness class," CBN Director Lisa Fernandez told The Daily. CBN's hired him for a new Balance Workshop that meets on Wednesdays at 12:30. In the past year, encouraged by City Council Member Ben Kallos, Howard led a walking group, sponsored by NYRR, on Friday mornings. That's how he and CBN got to know and admire each other. 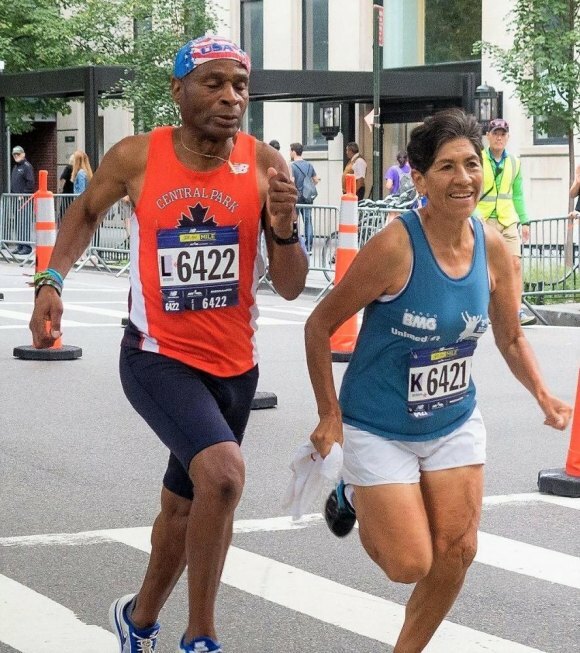 NYRR's schedule and leadership changes, Fernandez told us, on Thursday December 6th, when Howard's wife, Asteria, a former Bolivian track and field champion, steps to the front of the walking club. EMPIRE SPOTLIGHT: We recognize our athletes achievements which help build team spirit and inspire athletic advancement. November is known as Movember - Men's Health Awareness month. We encourage you to take action in staying healthy; physically and mentally. We chose our Empire Spotlight to shine a light on a special friend, runner and coach who’s everyday healthy lifestyle has kept him breaking barriers and defying his age. He is an example to men’s health and the running community. Sid is a longtime coach and runner, having a storied career which includes 50 Masters Nationals Championships and 8 World Masters Championships. Sid was inducted into the into the USATF Masters Hall of Fame in 2005. He has won 10 NYRR age group ‘Runner of the Year’ awards, won the 5th Ave mile 10 times, and this year he ran the 5th Ave mile for the 34th time, the only person to have run the race every year under the Masters Category. At 78 years of age, Sid has no intention of slowing down anytime soon. This summer, he and his wife Asteria joined Empire Tri Club in initiating and coaching the Hospital for Special Surgery Runners Club. The club is now it its second session which will run through mid-December. He has been a longtime (40 year!) member of the Central Park Track Club and a Coach for the New York Road Runners (NYRR) Team for Kids. Empire sat with Sid for a brief chat to learn more about his philosophy and give us his best advice for the track! EMPIRE: What is your coaching philosophy? EMPIRE: What motivates you to keep on training? SID: I like to see positive results. EMPIRE: What is the best piece of advice you can give someone, when racing? EMPIRE: Would you like to share a funny or crazy thing that's ever happened to you during a race? SID: I ran my 1st marathon without eating!